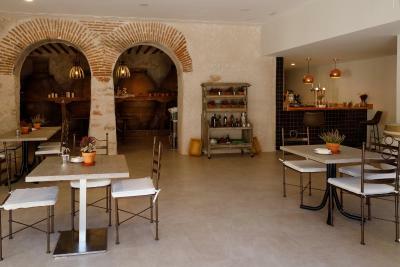 Located in Villarejo de Salvanés, La Bodega de Quintín has a garden, terrace, bar, and free WiFi. Featuring room service, this property also provides guests with a restaurant. The rooms in the hotel are equipped with a flat-screen TV. All rooms have a private bathroom. Aranjuez is 22 miles from La Bodega de Quintín, while Chinchón is 9 miles from the property. Adolfo Suarez Madrid-Barajas Airport is 34 miles away. When would you like to stay at La Bodega de Quintín? House Rules La Bodega de Quintín takes special requests – add in the next step! La Bodega de Quintín accepts these cards and reserves the right to temporarily hold an amount prior to arrival. We need at least 5 reviews before we can calculate a review score. If you book and review your stay, you can help La Bodega de Quintín meet this goal.